Doing things the right way: Former University of Iowa linebacker Mike Humpal speaks to the team Friday after practice while UI head coach looks on. IOWA CITY, Iowa -- Mike Humpal was a teammate with several of the current University of Iowa football players when Humpal starred as a linebacker for the Hawkeyes from 2005-07. Following a walk-through Friday, Humpal delivered a motivational message to the team as it prepares for Ball State on Sept. 25. "When you're going through here you hope you do things the right way," Humpal said. "You want to make sure you treat people the right way and this is a sign that maybe I did OK."
Humpal graduated in spring, 2007, with a degree in health and sports studies. He resides in Coralville and works as a sales representative selling implants for another former Hawkeye, Jason Olejniczak, at Biomet. "Now I'm getting ready for deer season to start," Humpal said. Humpal was named an Iowa co-captain prior to the 2007 season. He joined running back Albert Young as a co-winner of the team's Most Valuable Player Award following the 2007 season. Humpal was a two-year starter for the Hawkeyes. He was a four-time member of the Big Ten's all-Academic team. As a senior he led the Hawkeyes in tackles with 123. That figure is the 27th best seasonal tackle total in Iowa history. He led the Big Ten in tackles per game (11.8) in 2007. The New Hampton, Iowa, native had 197 career tackles and six interceptions. He played in the 2008 Hula Bowl all-star game and was drafted in the sixth round of the 2008 NFL Draft by the Pittsburgh Steelers. Humpal will accompany the Iowa captains to the center of the field for the pregame coin-flip. 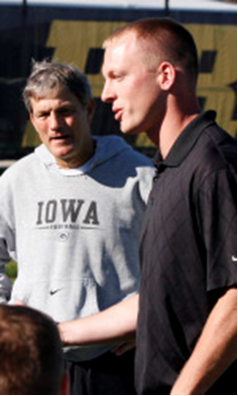 He will also be with the Hawkeyes in the locker room before and after the game and on the sidelines during the contest.